When it comes to options for Paleo meals, we all know that the menu is nearly as expansive as any other diet. But one thing that tends to come up is the lack of options for Paleo condiments – especially sauces. Traditionally prepared sauces, including ketchup, mayonnaise, and barbecue sauce, usually are filled with non-Paleo ingredients, including sugars, vegetable oils, and unneeded fillers. While we’ve already provided some great Paleo condiment options on the site, it’s always fun to have some other varieties available, especially if you’re looking for a unique recipe for entertaining. That’s why we love this Alabama white barbecue sauce recipe – the flavors here are from the south where bbq sauce varies region to region, making it a fun option to add to any cook-out. 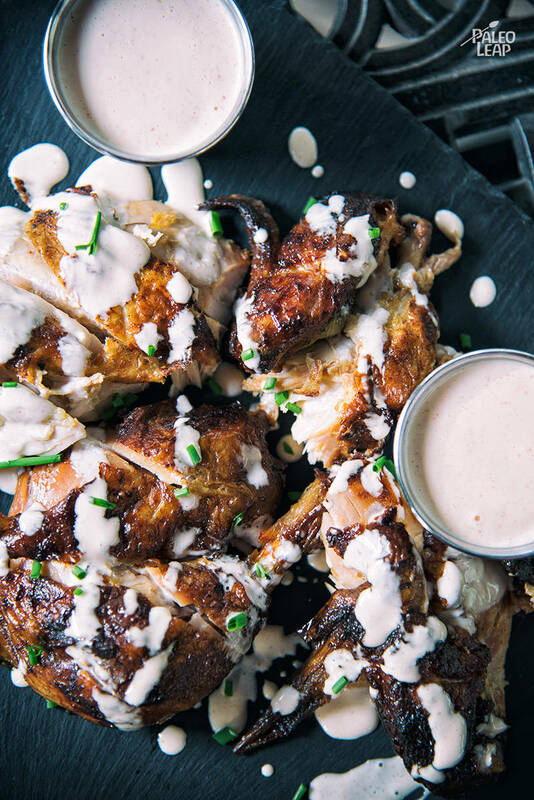 The key ingredient of this white barbecue sauce is the homemade mayonnaise. This is something you can easily prepare in advance and store until needed. Depending on how much you love mayo, you might find yourself using it pretty regularly as a condiment, so feel free to double your batch size and save for future use. In this recipe, this mayo base works to give the creamy texture needed for all of the other ingredients to bind together beautifully. The result? A sweet and tangy white sauce that works for anything you might be grilling up. The pairing possibilities for this sauce are endless – it’ll taste great with pork, chicken, beef, and even less common proteins. Just cook your main course to your liking and top with as much sauce as you’d like! Combine the mayonnaise, apple cider vinegar, lemon juice, hot pepper sauce, mustard, and honey. Season with onion powder, garlic powder, cayenne pepper, sea salt, and freshly ground black pepper. Mix everything until well combined and refrigerate until ready to serve. Serve the sauce with grilled chicken, pork, or beef.